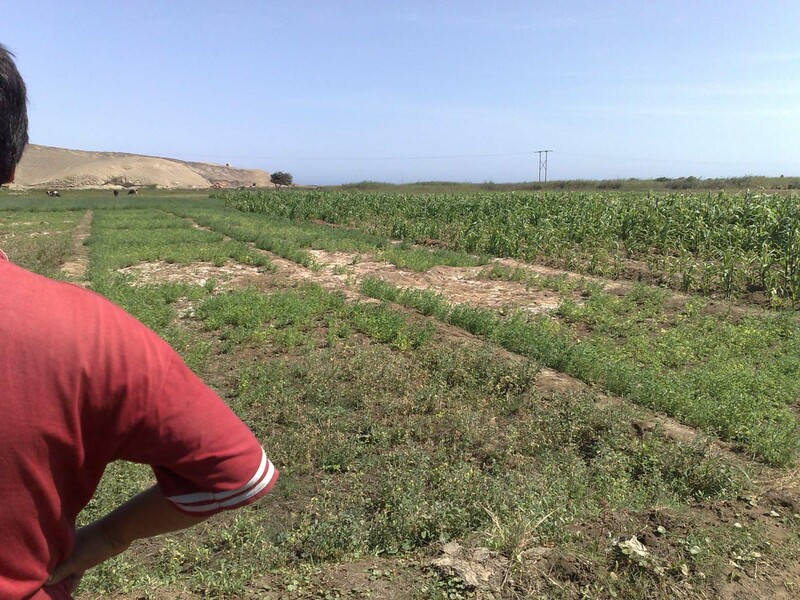 Since the opening of the website a number of questions about soil problems, reclamation, drainage systems, irrigation, land and water management, and statistics have reached me. Sometimes I was unable to provide an adequate answer. However, there were questions I could categorize and answer collectively through generalized texts that were made for the occasion. More papers can be found on the "articles" page and the "reports & cases" pages. The following 31 questions were frequently asked. 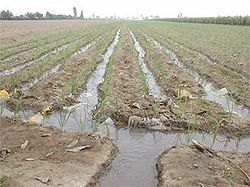 They are arranged by subject: (A) Drainage, (B) Irrigation, (C) Soils, and (D) Statistics. Waterlogging can be stagnation of water on top of the soil surface and/or the presence of a shallow water table inside the soil (at a depth of say less than 0.5 m on average). See also Wikipedia (watertable control). A2 - What is the tolerance or senstivity of crops to shallow watertables? Field measurements of crop yield and depth to water table are scarce and it is therefore not easy to present crtiical watertable depths for various crops. 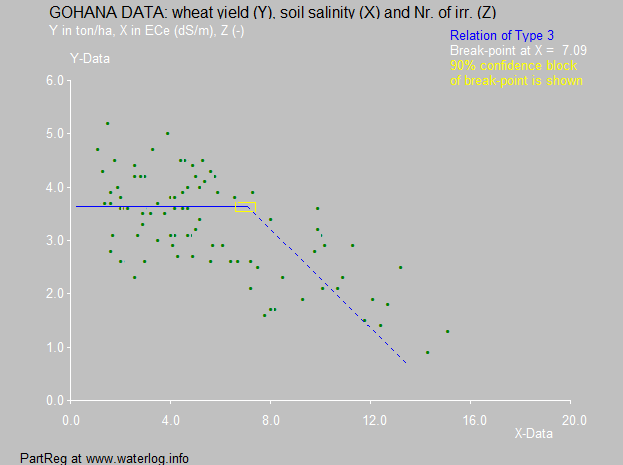 Data found in literature for wheat, banana, sugarcane and cotton have been analysed on the water tolerance page, giving also a classification on tolerance/sensitivity that may give a help with the formulation of a drainage criterion for these crops. A3 - What kind of drainage systems are applicable under what conditions? What is their relation to irrigation and soil salinity? See also Wikipedia: Drainage sytems, or: WaterWiki (Land drainage). A4 - How can I calculate drainage discharge needs and irrigation/leaching requirements for salinity control in waterlogged land using water and salt balances without resorting to simulation models like SaltMod and SahysMod? The answers, including the water balance of interceptor (interception) drainage, may be found in a lecture note on Drainage for Agriculture presenting Drainage and Hydrology/Salinity, Water and Salt balances. See also Wikipedia: Agricultural hydrology, and: Salinity control, or: Waterwiki. A5 - What is the influence of land slope on the spacing of subsurface drains? A6 - How can hydraulic conductivity (permeability) of the soil be measured and determined? For well pumping tests to determine aquifer hydraulic properties see the WellDrain model (see the software page). A7 - Drain spacing equations for horizontal tile/pipe drains are well known. Can subsurface drainage also be done by (tube)wells and, if so, how can the required spacing be calculated? The calculation of well spacings for subsurface drainage can be done with the WellDrain program (see the software page). The theory behind it is discussed in the paper Well spacing equations. A8 - How do the required drain and well spacings under the same conditions compare? An example of comparison drain and well spacings for horizontal resp. vertical drainage can be found in the spacings page. The well spacings are much wider. A9 - What is the optimimum depth of the water table and how can we develop suitable drainage criteria to design a subsurface drainage system? 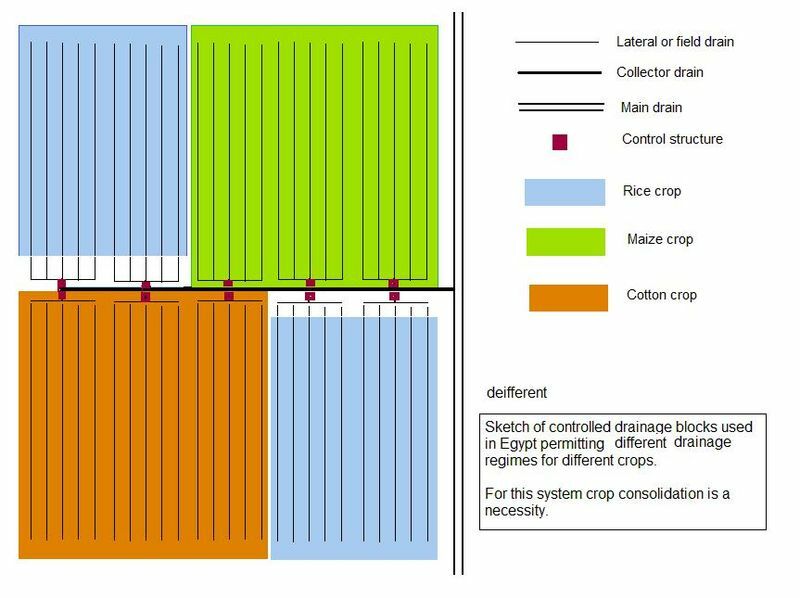 Examples of crop sensitivity to shallow water tables that has to be taken into account when formulating drainage criteria can be seen on the crops and water table page. See also Wikipedia: Drainage research or: Watertable control. A10 - How can surface drainage (runoff) be calculated from rainfall without using the complicated method with an instantaneous unit hydrograph (IUH) and convolution? On this website there is a method that uses a model of a non-linear reservoir for rainfall-runoff relations, and the corresponding software can be found on the RainOff page. In addition there exists the method of a cascade of linear reservoirs, all having the same raction factor, as elaborated by Nash. The software is to be found on the NashMod page. Further, on request, one can obtain software of a computer program for the method using two linear resrvoirs in series with different reaction factors (response functions). A11 - What envelope materials (filters, wraps) are used for pipe drains during their installation? This is a pdf file made of scannned pages on the subject taken from an ILRI publication. A12 - How is the river and surface water pollution tackled in The Netherlands? I am not a lawyer nor a specialist on pollution with organic compounds. Yet I made a summary of the Dutch "Law Pollution Surface Water" to the best of my ability. This is the summary. Further a powerpoint presentation of the summary ("summary of the summary") can be downloaded or viewed on-line. B1 - Is there global information on irrigation statistics, management, and environmental impact? B2 - What about water management, irrigation, drainage and soil salinity in alluvial fans or inland delta's? B3 - Is irrigation high up in the mountains feasible? B4 - What is spate irrigation, how effective is it, and what is its potential? This article discusses the problems and potential of spate irrigation in the NWFR province of Pakistan. Spate irrigation is done by qanats or karezes. It is also called flood recession cropping. B5 - What is tidal irrigation and how does it work? 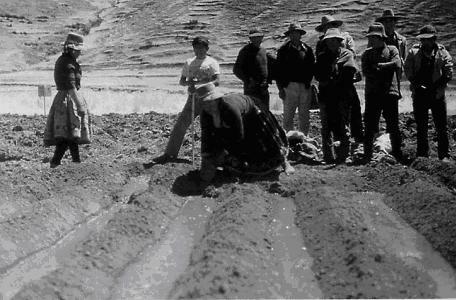 B6 - What does the irrigation in Egypt look like after construction of the Aswan High Dam? Please consult this report on irrigation improvement along the Nile river in Egypt. B7 - What is the development of river salinity in downstream direction when, in arid and semi- arid regions, the salty river water is used for irrigation of agricultural land and the drainage flow and effluent are returned to the river, and what are the effects on soil salinity and how can eventual problems of salty soils be tackled? salinized land with poor crop stand. C1 - What are saline and salty soils, how do they originate, where are they found, what is their problem, how can the problem be solved? What is their relation to irrigation, waterlogging and drainage? An article on the Chacupe case has appeared in the International Journal of Environmental Science, entitled "Reclamation of a saline vertisol by irrigated rice cropping, interpretation of data with a salt leaching model", see this website. In addition, a description of salinity development and control in a small coastal delta in Peru can be can be consulted here. See also "Salinity control" in Wikipedia, or: WaterWiki. C2 - What is salt tolerance of crops and are there any determinations of crop response to soil salinity under farming conditions? In this tolerance paper examples are given of determination of salt tolerance based on measurements in farmers' fields on the relation between crop production and soil salinity in 3 subtropical countries. See also the article that appeared in the International Journal of Agricultural Science, entitled: Crop Tolerance to Soil Salinity, Statistical Analysis of Data Measured in Farm Lands. C3 - What are alkali, alkaline sodic and acid sulphate (sulfate) soils (cat clays), how do they originate, where are they found, what is their problem, how can the problem be solved? This is a paper on soil alkalinity, sodicity and acidity. Alkalinity is strongly associated with the presence of soda (Na2C03, sodium carbonate) in the soil, ground or irrigation water. A report on acid sulfate soils in the island of Pulau Petak near Bandjermasin, South Kalimantan, Indonesia, can be viewed on line. The formation of acid soils occurs frequently in mangrove forest areas and is related to the presence of pyrite (Fe2S, iron sulfide). Here is an article on acid sulfate soils in Guinea Bissau. See also "Acid sulfate soils" in Wikipedia, and: Alkali soils in Wikipedia. D1 - What are the principles of cumulative frequency analysis and (discontinuous, composite) probability distributions (used in the CumFreq program, see the software page), and what to do if there is a discontinuity? What is return period and how reliable is it? An article on the use of the binomial distribution for the determination of confidence intervals and belts for cumulative probability distributions can be downloaded from this place, while a summary of it can be found over here. An article using composite (discontinuous) probability distribtions has appeared in the International Journal of Mathematical Methods, entitled "Siftware for generalized and composite probability distributions, see this website. D2 - What are the principles of linear regression analysis (used in the SegReg program, see the software page) ) and how are confidence statements and intervals determined. What is breakpoint (break point), threshold, and coefficient of explanation (determination)? One may also consult a paper on crop production and soil salinity: evaluation of field dat from India by segmented linear regression with breakpoint. The construction of confidence intervals along the regression segments with breakpoint and of the breakpoint itself can be found this confidence paper. D3 - The SegReg model (see the software page ) provides confidence intervals of the break-point (BP) in segmented linear regression analysis to test its statistical significance. How is that done? Is it necessary to additionally perform an analysis of variance (ANOVA) and F-test and how is this done? The calculation of the confidence interval of BP is done using the laws of propagation of errors as explained in the BP article. The wheat crop tolerates soil salinity (measured in electric conductivity, ECe) up to a level of 7.1 dS/m, beyond which the yield declines. D4 - Is there a away to determine the longest horizontal stretch while fitting a relation with a horizontal and sloping part to a number of data? 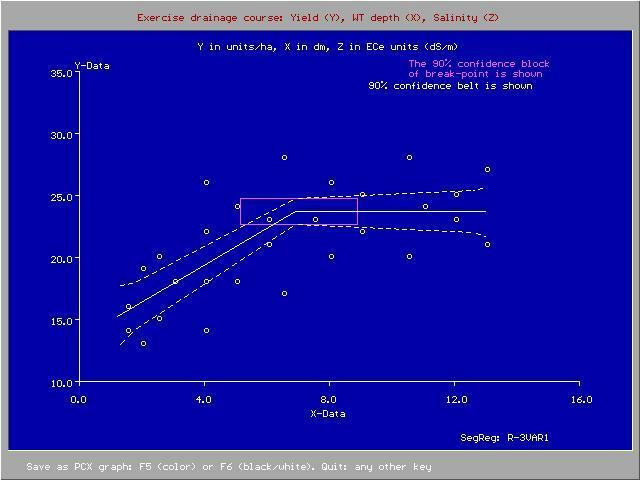 This stretch is needed to find out the range over which there is no effect of the influential variable on the goal variable. Recently I developed a method called "partial regression" eactly for this purpose. It can be found on the PartReg page. It can be used as a method to find the salt tolerance of crops as well as the sensitivity response to high watertables. D5 - Is there a calculator available for the t-test using Student's t-distribution in determining the confidence intervals in (segmented) linear regression anlysis? Yes, one may download the calculator from the t-test page. D6 - Is there also a calculator available for the cumulative frequency in the normal distribution? Yes, one may download the calculator from normal distribution page. D7 - Is there a technique to compare averages of different data series and to determine the significance of the difference between them. For this one uses Student's t-test. See the t-test page from where a t-test calcuator can be downloaded. D8 - Is there a technique to to fit S-curves to or third degree (cubic) polynomials to crop yield data to model the response to changes in growth factors. For this one can use the SegRegA model as explained on the S-curve page respectively the cubic regression page. For more papers proceed to the articles page, the published reports & cases page, the particular reports page or else return to the home page.